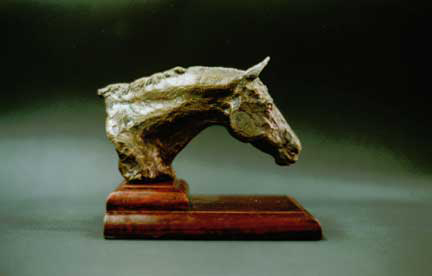 Private CollectionThis sculpture was my first equine sculpture, created cradle to grave by me. I never had formal training in sculpture and this was my second piece (following “Metamorphasis”). I learned the process of bronze casting through a course at the Art League in Alexandria, VA. I performed every step, from creating the mold, to spruing and investing the wax, to the casting and power tools, to the patina and mounting! My favorite memory of this piece is the comment that it reminded them of a Degas! Wow!